In order to accentuate the ingenious shape, the round, flat shape of the vase appears as two vases on the outside, one in front of the other. However, they are actually the bodies of two vases that are joined together as a single form on the inside. The rims are slightly inverted, the necks short, and the bases rectangular. The vessel is somewhat heavy and the surface decorated with patterns of blue and violet backgrounds. The backgrounds were then painted with various floral designs. 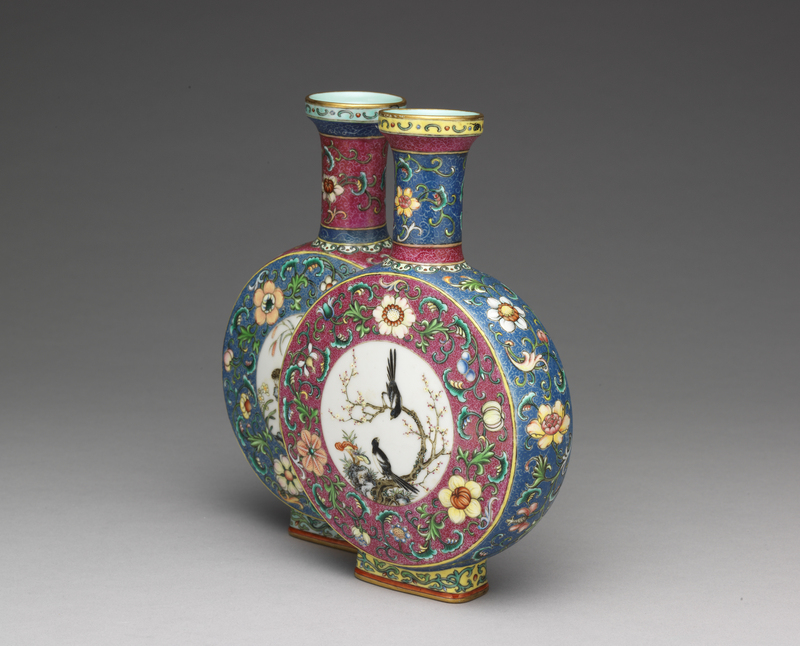 The center of both vases in this conjoined vessel have panels, one decorated with plum blossoms and magpies, while the other with narcissi and quails. Since the two are conjoined, the two panels overlap, with one partially in front of the other. Thus, one appears as completely round, while the other is in the shape of a crescent. This adaptation, along with the dual-color scheme of blue and violet, share the same vessel and create an interesting variation in which each part echoes the other. The bottom and interior of the vessel are covered with lake-green glaze, with the bottom inscribed with a six-character inscription in seal script that reads "Made in the Qianlong Reign of the Great Qing Dynasty." The conjoined vase shape had already appeared in official wares prior to the Qianlong reign and in the private sector. 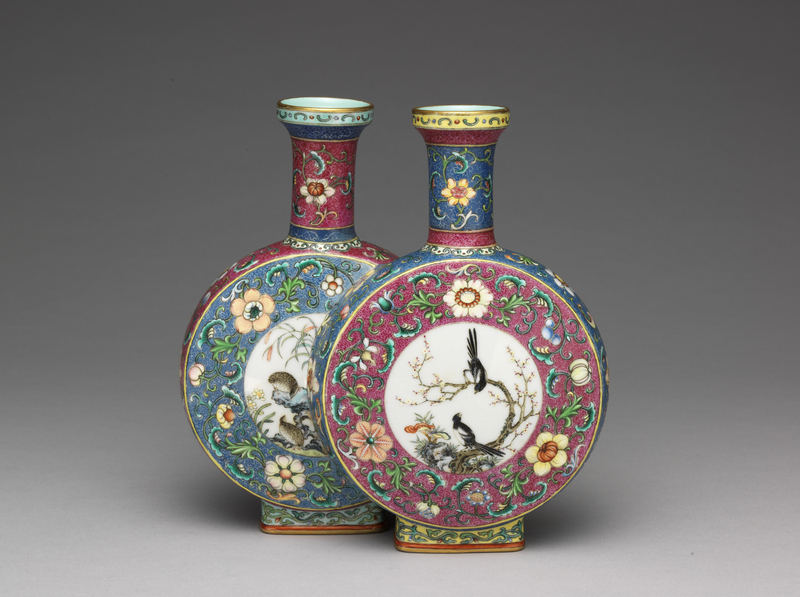 In order to promote the superior qualities and craftsmanship of Qianlong official wares, considerable effort was made to build on previous foundations and create various multiple-vessel shapes of even greater intricacy, revealing not only the superb craftsmanship of ceramics from this period but also the vivid imagination and insight of the artists who made them.